One of the biggest blows a business can experience is when a previously loyal customer decides it’s time for a parting of the ways. Regardless of the reason for the decision, losing a valued customer has many ramifications. The most obvious and immediate issue is the impact on cash flow. If the customer was a big spender and the split is unexpected, it’s likely to leave a hole that is going to have to be filled. A significant drop in income or in the volume of work may mean that staff cuts are required. However, such action needs to be carefully considered. Is the loss of trained and valuable staff truly warranted when compared to the future cost of having to hire and re-train new staff? It’s a tough decision that should never be made as part of a knee jerk reaction. The warehouse will also feel the impact with a probable oversupply when anticipated orders aren’t received. If the oversupply is too great or if any of your stock is specific to that customer, you may need to look at ways of shifting unnecessary inventory to free up cash and warehouse space1. When the customer is a significant figure in the market, news will spread quickly and the business reputation can be damaged. This is the time to make sure that you maintain your public profile and for you to demonstrate confidence in your business. If the departure of the customer is going to lead to questions from other partners, suppliers or customers, think about how you can explain the loss so that you downplay any concerns. Of course, all of these actions will impact staff morale so employee communication is critical. If you don’t keep your staff informed of the actions that you are taking, fear can spread and before you know it, you may face losing your best staff along with your best clients. At the same time, the message you give to staff has to be tempered. If the business is moving from a flourishing environment to one of survival, it’s going to require a different mind-set. Keeping staff communication positive but realistic will help to make sure they understand where you are heading and what is required. So how do you avoid all these problems and retain your best customers? 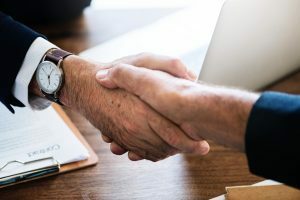 Following are 10 rules – some basic and some not so obvious – that will help you to establish client relationships for life. The customer is always right. It may be an oldie but it’s lasted the test of time because it works. If your customer isn’t happy, they won’t come back. So, if you have a customer that you want to keep, make sure you deliver what they are after. Be proactive in the relationship. Let them know if a breakdown with supply is about to happen. Send them alerts to confirm arrangements or to let them know when changes are made. Foster partnership. Prove to your best customers that you are looking out for opportunities on their behalf. If you find a product or service that complements your customer’s business, recommend it to them. If you learn of ways that will make them more productive or profitable, share the information. There may be no obvious benefit to your business from doing so, but with each step you are further cementing the relationship. Apologise when things go wrong. No matter how well-run your business is, things don’t always go to plan. If an error occurs find a way to repay or compensate your customer for the potential damage. Offer a credit note on their next order, send movie tickets or arrange a weekend away. Always aim to exceed the customers’ expectations. This was perhaps most famously stated by the 1700’s British writer and journalist, Nelson Boswell, when he said “Here is a simple but powerful rule – always give people more than what they expect to get.” Put yourself in your customers’ shoes and ask what would you want and how would you like to be treated? Then try to go one step further. Show that you are interested in their business. Make follow-up courtesy calls from time to time and check on customer satisfaction. Don’t leave all the communication to juniors, sales reps or line managers and don’t be afraid to ask your customers for their opinions. Depending on the size and nature of the business, it may pay to bring in a third party to conduct a formal survey every couple of years. Sometimes this approach elicits more honest answers as it allows customers to raise concerns that they may not feel comfortable discussing with your own staff. Don’t forget the value of face-to-face relationship building time. Company birthday or Christmas parties, sports or arts sponsorships all provide opportunities for you and your staff to meet socially with customers, extending the relationship beyond the phone. Such events also allow your customers to network and potentially gain through new business relationships. Personal touches like these go a long way towards developing loyalty that sticks. Provide a formal channel for requests to be received and acknowledged. Then make sure that your customers and staff understand – if it’s important or if you want it actioned, use the request channel. This helps to prevent misunderstandings. And don’t forget to provide feedback to your customers once the request has been reviewed. undertakings you are planning. It doesn’t have to be through a glossy newsletter – in fact, it’s probably better if it isn’t. Send a small update email, or if the relationship allows it, phone the customer and talk to them. Arrange a lunch or schedule extra time to an already-planned meeting. Just make sure you keep them informed. Never forget the role that staff plays. Provide your employees with training so that they understand how to be really great with your customers and reward them when they do something exceptional. Offer incentives for exceeding sales targets and acknowledge their work. Even though it is a subject that has filled entire bookshops full of management texts, maintaining customer relationships really boils down to common sense. Your customers are business people, just like you. They’re looking for pretty much the same things you are. When it comes to your best customers, recognise their importance to your business and never, ever take them for granted. Talk to them. Understand what they are after. Do what you say you will and if possible, deliver even more than you promise. With the right approach you may become just as important to their operations as they are to yours. Any feedback or questions, generated by this white paper, would be much appreciated. Jiwa is an Australian owned and operated software company that delivers exceptional ERP software. The software has been designed with maximum flexibility and functionality to suit Jiwa’s diverse range of users - catering for small/medium sized businesses to global entities. Jiwa Financials has been around since 1995 and is one of Australia’s most respected business financial solutions. The team is comprised of dedicated developers, support and sales staff who have extensive experience in the software industry as well as a sound understanding of current system trends. They also have business knowledge that extends across multiple industries and business types - they understand the needs of importers, distributors, manufacturers and service repairers. Find out more about Jiwa here.